The first couple of times I made them I used a chocolate buttercream icing. It wasn’t bad but these babies were made to go with a cream cheese icing (and also apparently boiled icing which I haven’t yet tried to make…yet). They are essentially chocolate cup cakes but with so much more decadence. Fun to make to as you throw the baking powder into the vinegar and watch it all fizzle. If ever you need to start sifting your dry ingredients it’s with these beauties. The more air the batter has the more velvety it is and trust me you want them as velvety and light as possible. This however also means that the cake is a delicate one and doesn’t do well will too many layers (perfect for cupcakes though). Preheat oven to 180°C and line your cupcake tray. Cream the butter then beat in the sugar gradually. Add the eggs – one at a time –beating well after each addition. Make a paste of the cocoa and food colouring and add to the creamed mixture. Add the salt, flour, vanilla extract and buttermilk, beating well after each addition. Sprinkle the baking soda over the vinegar and then pour the vinegar over the batter. Mix well. Bake for about 20 minutes or until the cupcakes bounce back. In a medium bowl, cream together the cream cheese and butter until creamy(I gave me a hearty mix so that it got as white as possible). Mix in the vanilla, then gradually stir in the confectioners’ sugar. Store in the refrigerator after use. 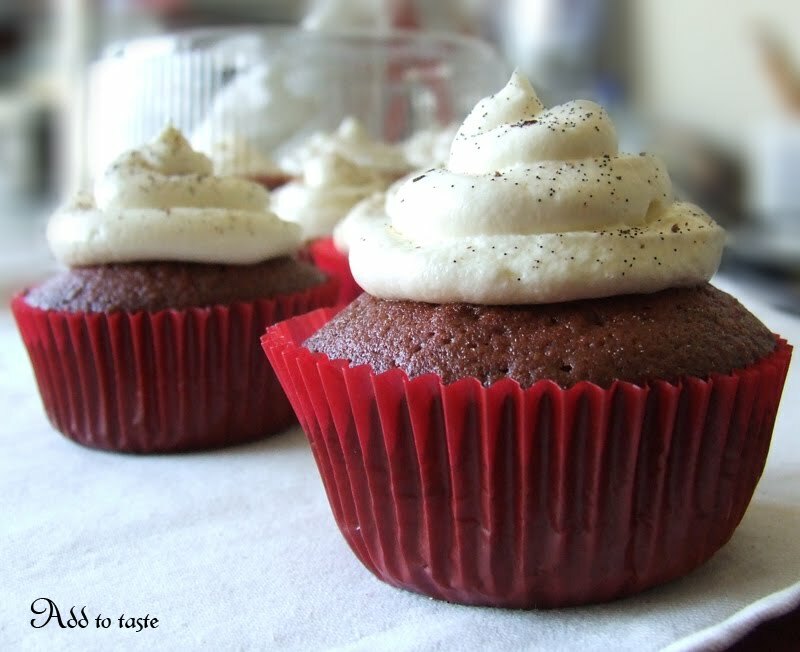 I made red velvet cupcakes for my 24×24 meal – they look amazing! Well done on the yummy cupcakes! I can't wait to try them as they're own of our favourites too! I've loved red velvet since I first laid eyes on it and more since I actually tasted it. I had a recipe for red velvet cake that involved a lot more work and wasn't nearly as yummy! Thanks for this. This is genius! I will be industriously producing this nommables in short order.